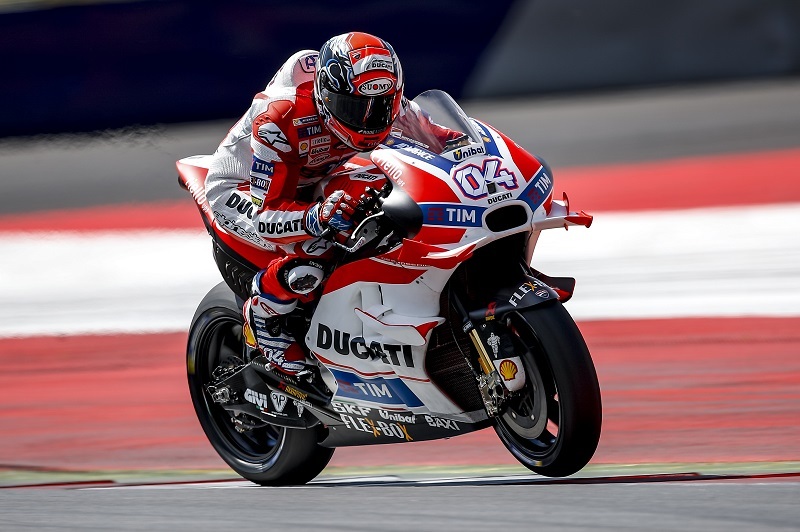 The first day of testing organized by Ducati at Zeltweg’s Red Bull Ring circuit, where the Austrian GP will be held on 14 August, came to an end this afternoon at 6 pm. A total of 21 riders and test-riders from all manufacturers present in the MotoGP World Championship, were on hand to get to grips with the new Austrian circuit for the first time. The Ducati Team lined up with its regular pairing of Andrea Iannone and Andrea Dovizioso, who were joined on this occasion by their special test-rider Casey Stoner. The results of the first day of testing were excellent: Andrea Dovizioso set the quickest time of the day in 1’23.764, followed by his team-mate Andrea Iannone in 1’24.347, while Casey Stoner placed fourth, with a best lap of 1’24.502, behind Scott Redding (Pramac Racing) and a total of eight Ducati riders were classified in the top 10 (Barbera in sixth, Laverty in seventh, Petrucci in eighth and Hernandez in tenth). Tomorrow the MotoGP riders will be out on track again from 8.30 am to 12.00 and then from 1 pm to 6 pm for the second and final day of testing. Checking in on FMX: A Double Front Flip?